WAFFLES: Hey Boss! It's #WafflesWednesday, what are you doing here??? KATIE: Waffles, get off of my Blue Suede Shoes already! WAFFLES: Sheesh, Boss. You've really Lost That Lovin' Feeling. 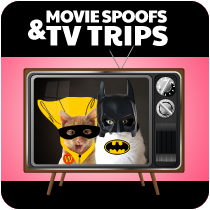 WAFFLES: Check it out everybuddy! Elvis is IN THE TOWHNOUSE! 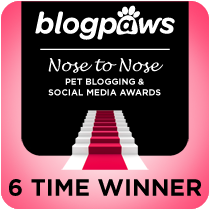 Next week we're all going to Nashville for the big BlogPaws conference and I've got more bling that the Boss! KATIE: So Waffles, Elvis is really more of a Memphis icon, not Nashville. Don't you think you're going to be a little overdressed? WAFFLES: Whatever, Boss. The ladies LOVE Elvis. And I LOVE the ladies. So there. 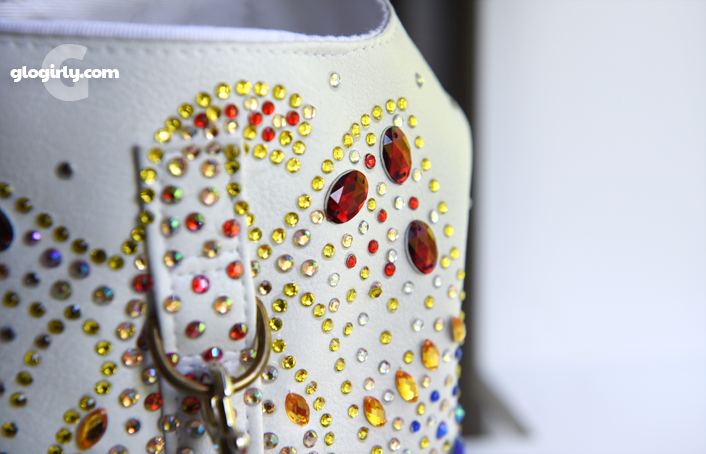 If you tuned in a couple of weeks ago, you may have seen our feeble attempt at a harness with a detachable elvis collar. Can you say #CraftProjectFAIL? A good friend of Glogirly's posted something to Facebook that really hit home. It read, "Why spend $7 on something you can make for $92 in craft supplies." Well we spent a little more than $7, but we found THE perfect Elvis harness. This vest-styled harness is inspired by his 1973 Aloha from Hawaii concert. Almost 1.5 billion viewers worldwide tuned in to what was the biggest television concert event of it's time. Glogirly was only 10 years-old and she vividly remembers watching it on TV with her mom, who had a HUGE crush on Elvis. Her mom would giggle with delight if she could see Waffles in his Elvis vest now. 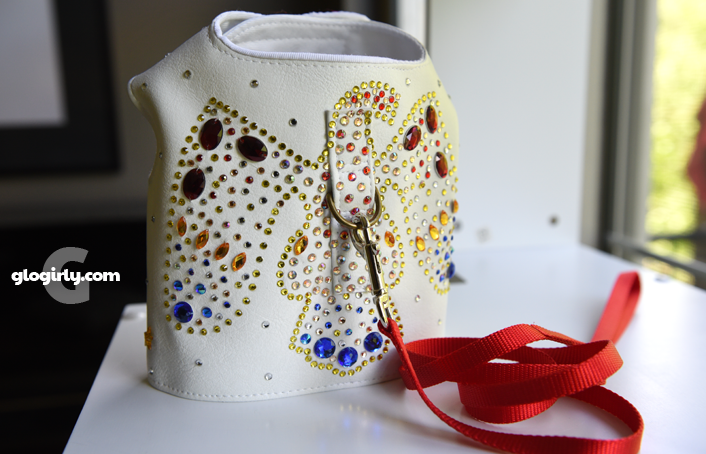 Fashioned with white leather & fabric and embellished with sparkling jewels in an eagle design that looks like the original cape Elvis wore, it's a work of art. 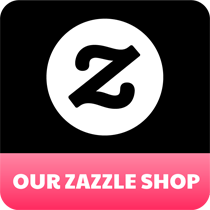 We bought it online from a sweet little shop in London called Tallulah Couture. Though most of their designs are intend for dogs, we could tell by the styling that it would be a good fit for Waffles because it's similar to some other vest-styled harnesses he has. 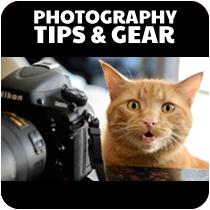 It's got super strong velcro at the neck and tummy and a d-ring on the back for a leash. This kind of harness is not something you'd want your pet to wear unsupervised or for long periods of time, but it's perfect for Waffles' Kitty Cocktail Party. We'll be bringing a few of his other harnesses along too. He's got almost as many as Glogirly has shoes. WAFFLES: So Boss, do I look like a hunka hunka Burning Love? KATIE: I don't know Waffles, is it too late to Return you to Sender? We just LOVE the Elvis vest! We can't wait to see how Katie is going to look. 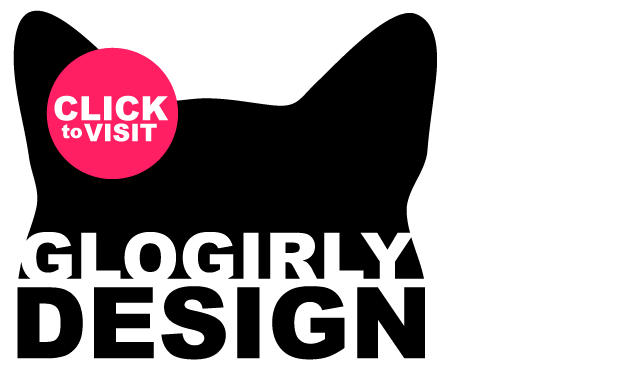 You all rock around the clock! 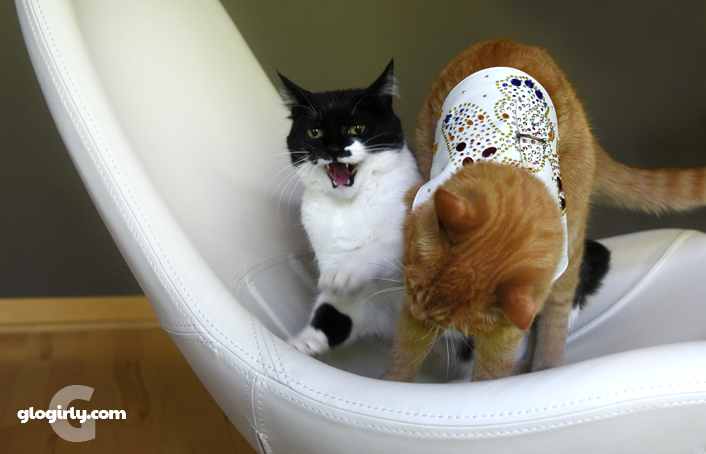 Wow, Waffles, are you going to shake your hips like Elvis too? So WaffElvis is a harness whore? It is pawsome! We can't wait to see it in purrson! Rhinestones are definitely appropriate for Nashville too! Wooohoo lookin smart that boy. Katie - blow him away with your Tuxi-TUDE!!! Waffles buddy, you are going to be the best dressed guy in nashville. The ladies are going to love you in all that bling. Work it for all you are worth. We're MOLing at that last line, Katie. 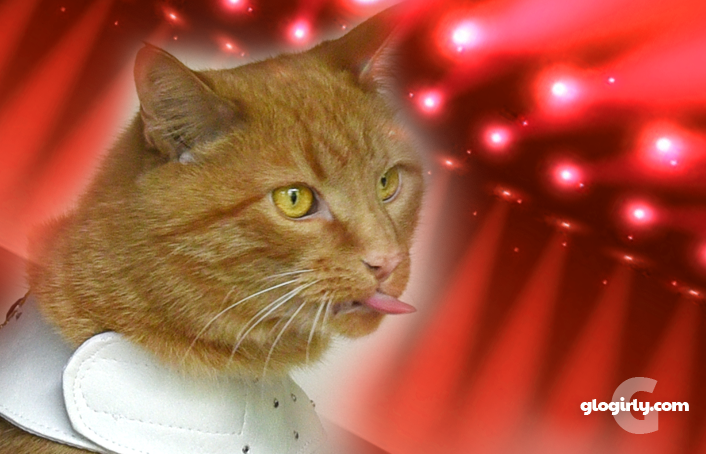 You're one sharp-dressed cat, Waffles. A sparkly vest all the way from the other side of the pond for your party. This is going to be epic. Whoa! That is one good looking harness. How's Katie gonna match that?? Waffles is a little orange Hunka Hunka Burning Love! Katie will be lovely, I'm sure. Yowza Waffles! That's a really cool vest! Mom can't wait to see you and GloGirly in Nashville! The woman says you are definitely a hunka burning love! Waffles, I would not let that harness NEAR me, but I know you will be a super star in it. 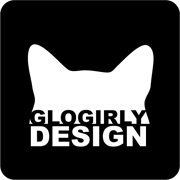 Maybe you can even get Glogirly to detour past Tupelo or Memphis. 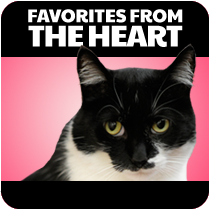 We are hunka hunka in love with that vest, Waffles! You look meowvelous! Ok Waffles, you just look fantastic in that Elvis harness!!!!! 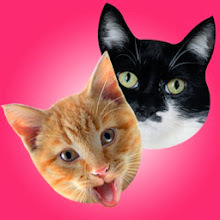 Wow..you are gonna be one cool cat at BlogPaws Waffles..The ladies are gonna faint buddy.. 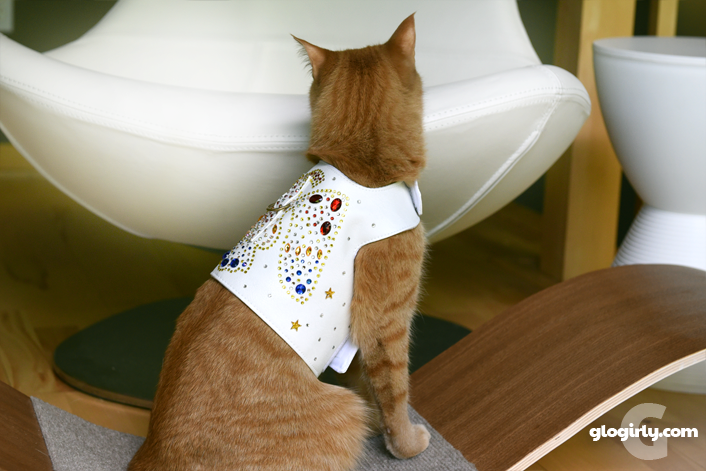 I must confess I'm not a huge Elvis fan, but i love this Elvis harness. Waffles looks great in it! Hunk of Burnin' Love indeed! You are rockin' that harness Waffles! LOVE IT! You are much better looking than Elvis, Waffles. Did someone say you are having a cocktail party?!? EL Waff we think you are the KING with some fur! I'M LOVING THIS!!!! You guys crack me up!! Katie is having a hissy fit!! 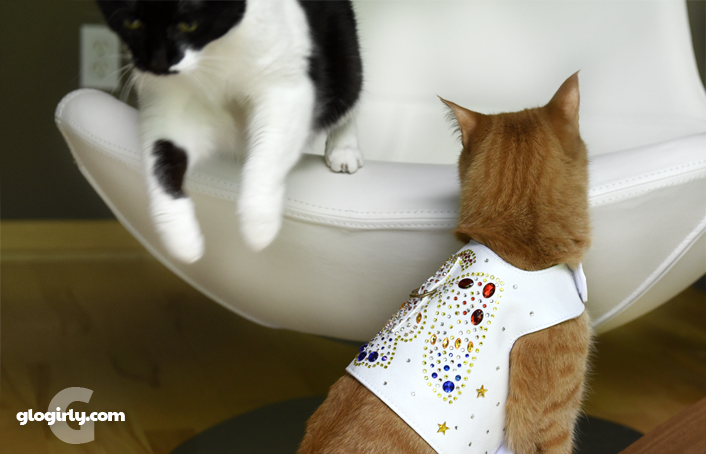 Waffles you look HOT in your Elvis outfit! The ladies will go craaaaaazzzzzyy for you!! I have to show this to my mom. She is a HUGE Elvis fan like me. 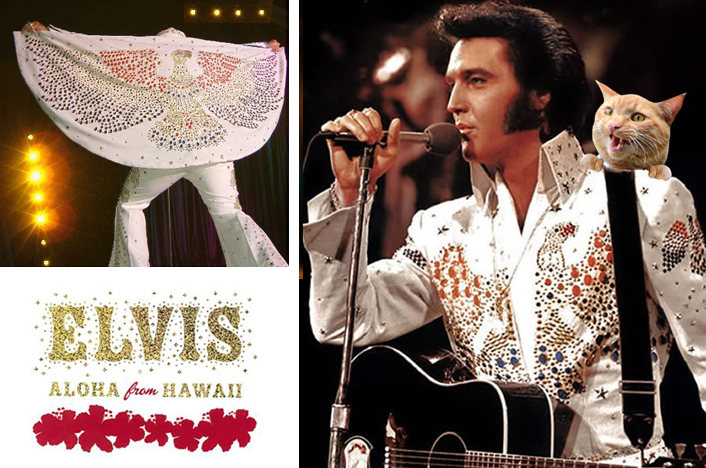 I was only 4 years old when Elvis had that concert in Hawaii but I grew up listening to him all my life and continued collecting concerts of his etc...that harness is perfect! MOL I just knew "Return to Sender" would come up!!! That' so cool. Your looking pretty good Waffles. 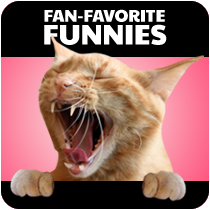 You guys sure did make us laugh with that post and those great pictures. Thankya. Thankyaverymuch! Real leather? Hope not. Waff, you’re gonna be some ladies Teddy Bear after the pawty. TW might be Falling In Love with You. And all Plush CK gets is a $1.99 tank top. Sigh. I'm all shook up! You look marvelous! Waffles, I Can't Help Falling In Love With You. Just think what Elvis might have done if he'd had orange stripes! I love the real Elvis, but you make me swoon even more, Waffles!!! Wow Waffles that is some super duper outfit! Just don't be a hound dog Waffles! Ya look great! Wow Waffles, you got all blinged out here. You will surely blind all the ladies you meet. 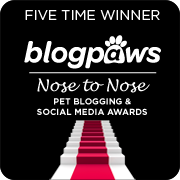 Have fun Waffles & Katie at BlogPaws! You are very Handsome as Elvis Waffles!